We’ve already showed you how to translate business goals to analytics goals, and we’ve provided clear instructions for how to set up Google Analytics Goal Tracking. With this in place, you’re able to track all conversions in Google Analytics and even import them directly into Google AdWords. That’s enough, right? Why would you even bother to set up AdWords conversion tracking separately? Simple: to give AdWords the credit it deserves! You may know that, by default, Google Analytics attributes every conversion to the last non-direct source. That means that if your customer’s last contact with the site was via Google organic search, even if an AdWords ad was technically their first point of discovery, the conversion will show up as coming from google/organic. Over time, this can actually skew your understanding (or your boss’ understanding) of the success you’re seeing from AdWords. Here at Megalytic, we believe it’s important that AdWords receives at least some credit any time it was part of a user’s process of finding your site. By setting up AdWords conversion tracking, you’ll be able to credit conversions to AdWords that occur within a specified window of time (default 30 days) after a user clicked an ad, even if that person came back via another source. 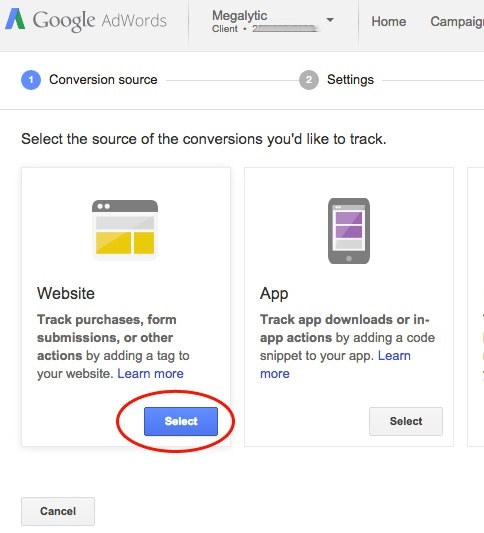 Setting up AdWords tracking also allows you to track unique conversions. This means that if the same user fills out forms multiple times on your site, you’re only tracking one conversion per user. In contrast, Google Analytics will track multiple conversions from the same user if they happen across different sessions. Of course, if for some reason you want to count every conversion separately (say that you sell products via your site and the same user could be making multiple purchases) you can still count all conversions. Now that we’ve established the need to set up conversion tracking directly through AdWords, you need to decide how you’re going to define a conversion and what it is you’re going to track. A conversion should correlate with someone showing interest in your business beyond just a casual visit to your site, including any activity from a contact form submission to a free ebook download. If you are running an Ecommerce site, you may want to define any purchase as a conversion. Once you’ve determined a conversion to track, you can then proceed to setting up the tracking code and putting it into your site. 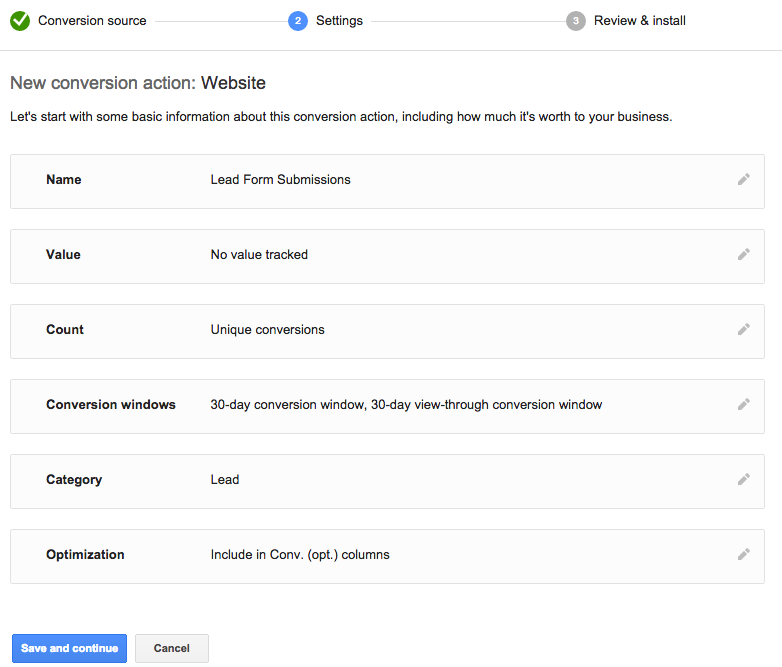 AdWords provides a simple step-by-step process for setting up a conversion. Within your AdWords account, click Tools from the navigation bar and select Conversions from the dropdown menu. When you start creating a new conversion, you’ll see several options for conversion sources. For this example (tracking a form submission), we’ll choose Website. Next, you can customize several options for your conversion. Name: Give your conversion a custom name to distinguish it from other conversion points on your site. Value: Assign a currency value to a conversion. Count: Decide whether to count total conversions or unique conversions. The “unique” setting won’t count multiple times if the same person submits a form more than once. Conversion windows: Determine how long after a person visits a site to credit a conversion to AdWords. For example, within a 30-day conversion window, a person who clicked an ad at some point and came back to the site a couple of weeks later would still be credited as an AdWords converter. Category: Designate a conversion as a purchase, sign-up, lead, view of a key page, or other. 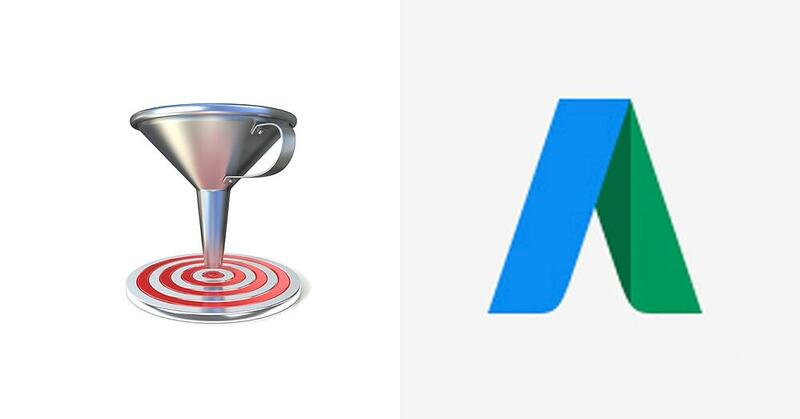 Optimization: Choose to use this conversion for AdWords bid strategies. Once you’ve selected the options you want, you can proceed to the next page. Here, you’ll be given code to add to your site to begin tracking conversions from AdWords. Consider keeping this page open in a separate tab while we go over getting the code into your site. 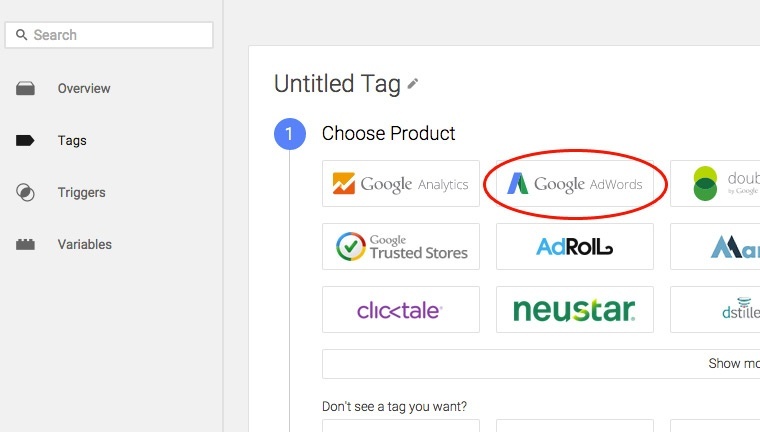 Our recommended method of adding is via Google Tag Manager. Google Tag Manager (GTM) provides an easy way to set up AdWords conversion tracking without forcing you to mess with the source code for a site. Once the GTM code is in place across a site, you can set an AdWords conversion code to fire on the submission of any form. 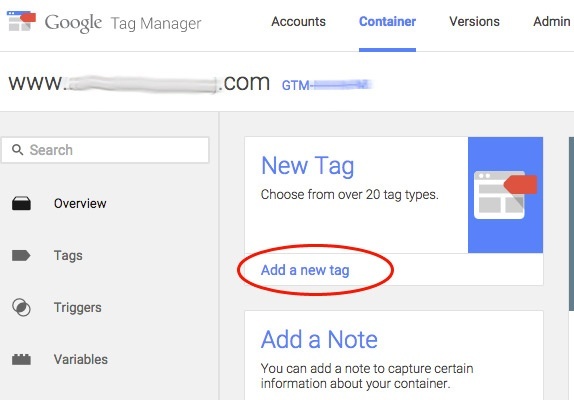 First, from within your site’s container in GTM, add a new tag. You’ll now see a list of several types of tags you can create. Choose Google AdWords. Next, choose a Tag Type of AdWords Conversion Tracking. You’ll then want to cross-reference your AdWords Conversion code to input the Conversion ID and Conversion Label. If you are tracking values, you’ll want to fill in the Conversion Value field, as well. Finally, in the fourth (“Fire On”) section, you can choose when to fire the conversion tracking code. If your site serves a “Thank You” page to users who submit the form, select “Some Pages.” In the box that pops up, create a trigger based on the page that should fire the conversion. For this example, we want the conversion code to fire on a page that ends in /thankyou. Of course, your Thank You page URLs may differ depending on your site’s setup, especially if you have multiple thank you pages. Once you’ve set up the tag via GTM, don’t forget to publish your container live (button in the upper right), so the code you just configured will be enabled on your live site. With the conversion tracking code set up and deployed on your site, you can now track results as they come in. To do this, check the Converted Clicks column within the interface. If your code is installed properly and people are indeed converting on your site, you should begin to see numbers here. Note that by selecting the various tabs within the interface, you can view conversion data on the Campaign, Ad Group, Ad, or Keyword level. Each of these views will allow you to further optimize your account. For example, you’ll want to use successfully converting ad copy to guide writing of future ads, while bidding up or down on keywords based on conversion performance. When running an AdWords campaign, be sure to set up conversion tracking for any actions on your site that correlate to leads for your business. AdWords and Google Tag Manager provide a fairly user-friendly process for creating a code and getting it to fire on a form submission within your site. Once you’ve set up conversion tracking, use it to measure the success of your campaigns and the value of AdWords in driving business.